Like all year-end posts, I'm going to start by saying I can't believe there's only a day left until 2014! 2013 was such a crazy, crazy year and yes, it was also bittersweet. I had high hopes for 2013 since I had an amazing year before that (I still get super giddy when I read that) and I'm so happy that this year truly delivered! I look back and think of all the things that happened. Some days were fantastic and some days I feel like the joke's on me. The roads were definitely rough and I'm just so glad to have friends to help me along the way. I wish I could say that it was as great and smooth as 2012 but no, it's not. But that's not enough reason to say that this year sucked because it definitely did not. This year taught me one thing: In life, there's always different perspectives. This year, I attended the Hot Air Balloon Festival in Pampanga, went to Ilocos, San Juan, La Union, visited Enchanted Kingdom for the first time, been to Baguio twice (celebrated my birthday there! ), had a trip to Naga and Legazpi, and went to Boracay with my family. I've been to so many places this year, I think I've developed wanderlust. And for some reason, it gives me satisfaction whenever I wake up in a different place. There's comfort in knowing that you're not constantly in the same place, waking up on the same bed, opening your eyes and seeing the same white-colored ceiling, and just that thrill that there's something to look forward to everytime you wake up. So. Many. New. People. This. Year! New friends. New acquaintances. New stories. New lessons. I immensely enjoyed meeting all the people I met this year because they were all different in their own little ways. But I do admit that sometimes I get intimidated. They all had their stories to tell. There's so much personality, it's hard not to soak up all the newness and not get infected and be inspired by it! Inspired to write more, inspired to be my best self, inspired to push myself further, inspired to try something new, inspired to inspire others. And sometimes I feel like I'm not the same person anymore. My favorites were attending the Luna Festival, the tribute event to Agit Sustento and Talahib's gig at Baluarte JTG last Saturday! Too many awesome people! Thanks for always letting me tag along, Muffet and Burn! And then there's the new people that always let me crash at their place when I have nowhere to go in the middle of the night or just because I feel like it, those that I had long talks and shared stories with, those who gave me advice on how to go about things, those that I barely knew but assured me that things will get better. Of course, the people who stuck with me amid my cray-cray episodes this year. This year was fun but there was also a bit of drama. I know some of my life long friends are tired of hearing the almost decade old news of my indecisiveness but still they were true friends and listened until their ears fell off. Hahaha. I couldn't be more thankful for having friends like these. The officemates that I've gotten to know better this year, friends that always stayed in touch eventhough I'm so bad at replying to their text messages or returning their calls. College friends that I get to see every month and forgive me everytime I'm late or did not show up. My childhood friends that are just always there, just a phone call away. Heeh. Yep. We had a lot of gastronomical adventures this year. So happy to have found gems such as Ba Noi's and Joe's Meatshack in Kapitolyo, Kanto Freestyle Breakfast, Happy Han Bapsang, Torch Restaurant, Rustic Mornings and all the restaurants we went to in Baguio and Naga! More to come next year... after we lose x pounds. Hahaha! Not to be materialistic or anything, but I felt a sense of accomplishment when I FINALLY purchased my own laptop with my own money! Felt so damn good. I've been wanting a laptop as far as I can remember and finally, this year, I crossed it off my list. I can be a better blogger now. Or not. Hahaha. Thank you for your patience, too, Ian. Haha. 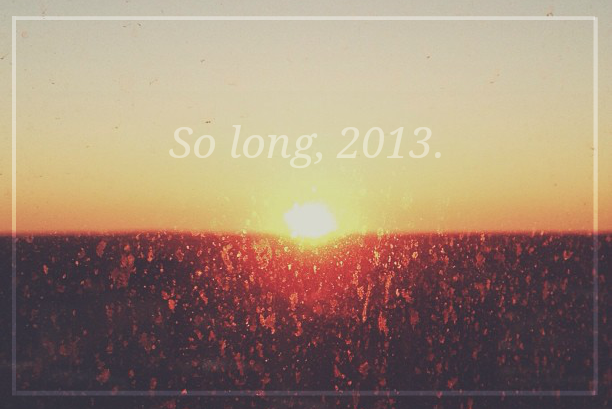 So long, 2013! It's been a great year. Let's make the next year even better!